Sweet potatoes, everyone’s favorite excuse to eat brown sugar and marshmallows for dinner. But what are they? And are they as healthy as everyone says? Well read on, my sweet potato compadres! Difference between sweet and white potatoes? Are they the same as yams? Answer: A lot and no. The sweet potato is distantly related to the white potato. 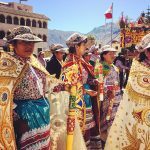 While both originate in Southern Peru (not Ireland! ), their nutrient compositions are pretty different. Sweet potatoes, while having the same amount of carbohydrates as white potatoes, have more fiber, twice the vitamin C, and WAY more vitamin A. 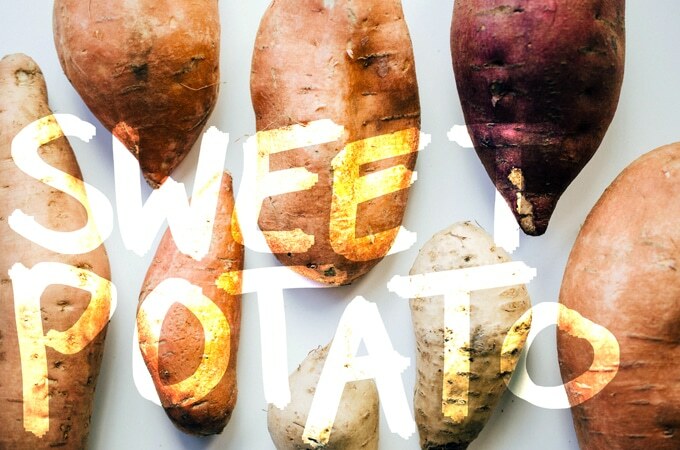 Read more about the nutrients in sweet potatoes at the bottom of this post! But the difference between sweet potatoes and yams? Now that’s a bit trickier. 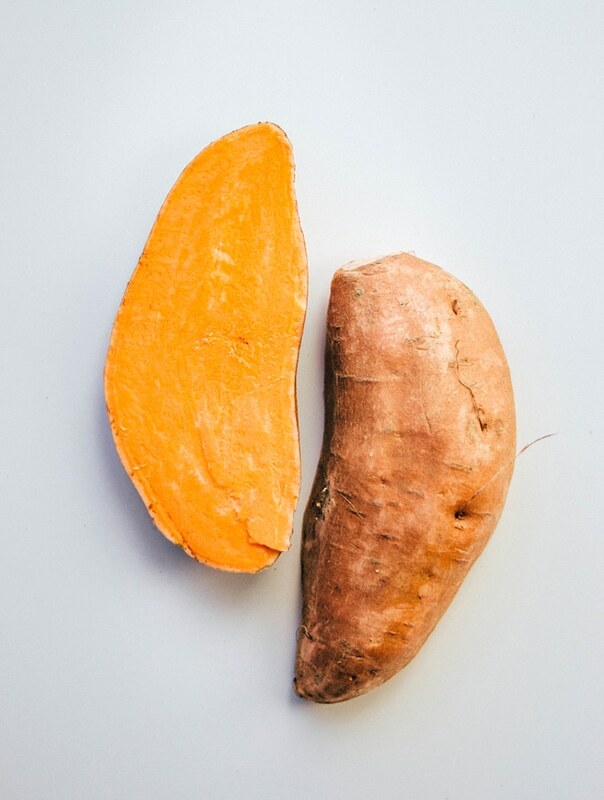 Though sweet potatoes and yams are in almost no way related (yams native to Africa and Asia), we have a tendency to call sweet potatoes “yams” in the U.S. 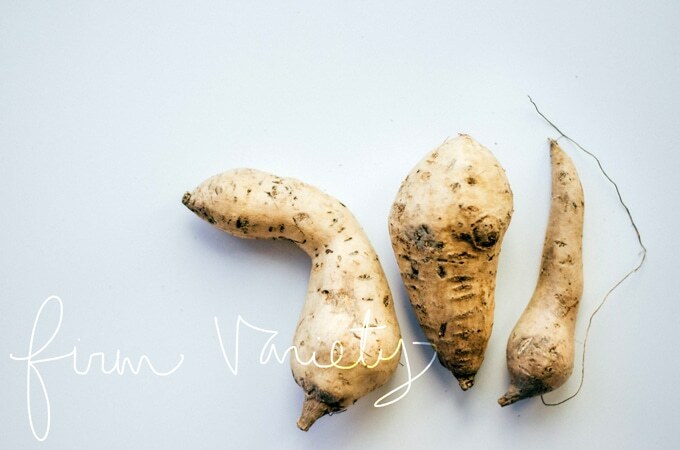 True yams are very starchy and dry and can be pretty difficult to find in your everyday grocery. So why do we call sweet potatoes “yams”? (Can you sense the food history coming?!) Well there are two general varieties of sweet potatoes, firm (lighter color) and soft (deeper golden color). 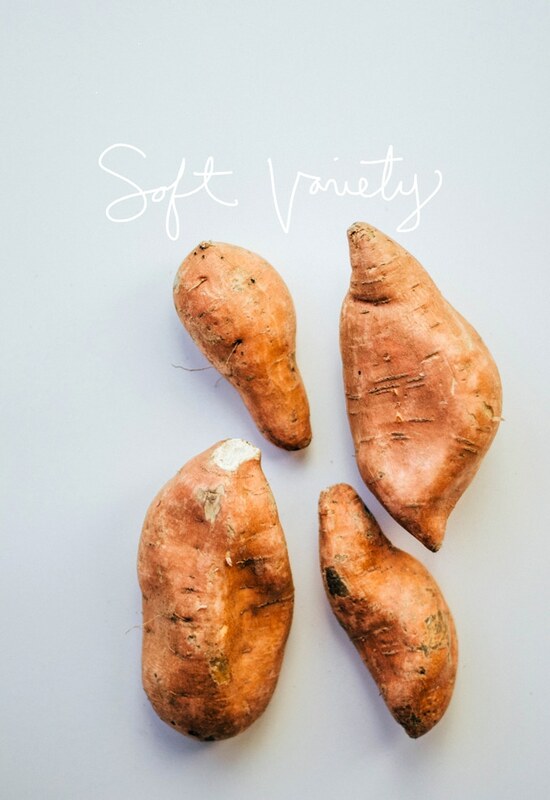 The firm variety established itself in the U.S. first, dubbing the name “sweet potato”. So when the soft variety began to gain traction, they needed a way to distinguish it from its firm counterpart, hence we call the soft variety “yam”…regardless of the fact that there is near to no relation. So although the United States Department of Agriculture now requires all true sweet potatoes to be labelled “sweet potatoes”, be aware of this misnomer next time you’re rounding up sweet potatoes for your mashed sweet potato casserole. As mentioned above, there are two general categories in which a majority of the hundreds of varieties of sweet potatoes fall under. Soft Sweet Potatoes: Reddish/copper colored skin and orange/golden flesh. These are great for baking and mashing! Variety includes: Jewel, Garnet, Covington. Firm Sweet Potatoes: Light/golden skin and pale/white flesh (these can sometimes be purple too). 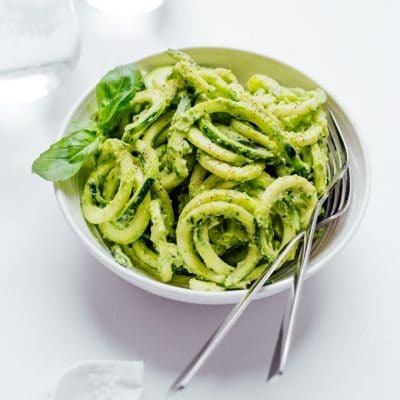 These hold their shape well, making them great for soups or fries. Variety includes: Hannah, Japanese (though the skin is purple with this one), Purple (the whole thing is, well, purple), O’Henry. Look for a small to medium sized sweet potato. Generally, the larger the potato the starchier it is. A deeper orange color alludes to higher vitamin A content. Note that these aren’t as hardy as white potatoes, so avoid choosing any with cuts and bruises, as these will deteriorate more quickly. 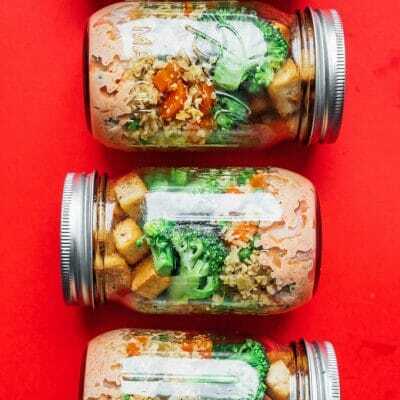 Store ‘em in a cool dry place, like the pantry (no the refrigerator), for about 2 weeks. 377% DV of Vitamin A: Provides the provitamin version of this fat-soluble vitamin, meaning it comes from a plant source and your body converts the plant pigment into active Vitamin A. It is essential in many components of healthy vision, as well as immunity and cell growth/differentiation. 17% DV of Manganese: A trace element that plays a role in healthy brain and nervous system function. 14% DV of Vitamin B6 (Pyridoxine): A water-soluble vitamin that works behind the scenes as a coenzyme in many important reactions within your body, including protein metabolism and red blood cell formation, among countless other functions. Great post, Sarah. Thanks for answering the sweet potato vs yam question. I was baffled for a long time because yam in Southeast Asia is a very different thing. I love them both though. Have you tried Japanese sweet potato? From the sounds of it yea, yams are verryy different! I have a Japanese sweet potato sitting in my pantry awaiting inspiration (the photos of it turned out a bit blurry so I didn’t include them). What do you like to make with Japanese sweet potato? I need some ideas! I’ll definitely give it a go! With a sprinkle of salt, pepper, and thyme 🙂 Thanks Christine!! I asked my mom to pick me up some sweet potatoes. She grabbed some of the firm variety. I had no idea what it was. I’m so used to seeing the orangey ones. I feel so educated about sweet potatoes now. I love knowing the history behind food. I did not like them. It didn’t work at all. I make a beet, goat cheese, and sweet potato galette. You use a mandolin to get the slices all pretty and layer them. The colors are gorgeous. The firm sweet potato really let me down in both appearance and taste. I’ve been wondering this – Are the purple potatoes you find in fingerling potatoes technically sweet potatoes? Yea I tried just roasting one of the light firm ones last night and wasn’t keen on the taste or texture. Sort of sweet like a sweet potato but not near creamy enough. 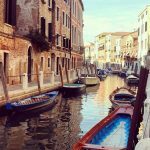 And since I love food history I just went on a hunt to answer your question. From the looks of it, no I don’t think the purple fingerlings are sweet potatoes. The purple fingerlings are heirlooms so they go way way pack to when potatoes first potato-ed in Peru. So while it looks like they’re defiantly related (because all potatoes go back to Peru), I don’t think they’re in the same family…unless we’re talking red-headed step child twice removed kind of family. I am addicted to sweet potato fries!!! Come on back in about a week! I’ve got a killer sweet potato fry recipe with an avocado + Greek yogurt dipping sauce of sorts. Let’s just say I ate the whole recipe (2 big sweet potatoes worth), by myself, in one sitting.